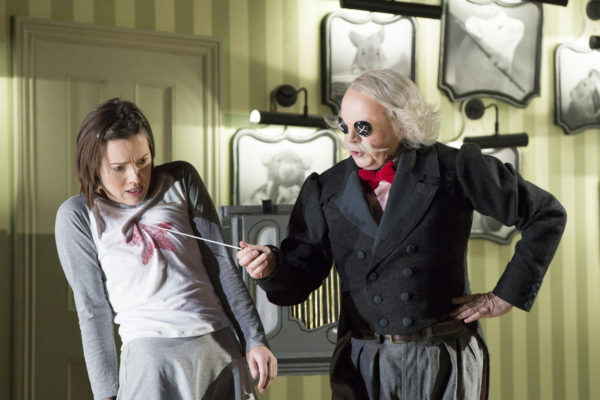 A magnolia paint job: Maddy Costa reviews the Royal Opera’s adaptation of Neil Gaiman’s story. The trouble with taking an actual child to the opera is that they don’t always behave in the way opera-goers who have paid good money for the experience might expect their fellow audience-members to behave. An actual child might, for instance, stick their thumbs up in the air when one of the characters admits that school can be miserable. Or, when the same character – Coraline’s mother – says she has too much to do to spend time with her daughter, actual child might lean over to their own mother and, with raised eyebrows, poke an accusing finger in her face. So far, so charming, but when bored, actual child might start ruffling their waterproof coat, or sinking out of their chair to the floor, only to bounce up into an exaggerated stretch. By which point, actual child’s mother might be squirming herself, with embarrassment. It’s a weird middle-class affliction, this desire to inculcate in your kids a passion for art, rather than letting them discover it in their own time. Said actual child – my nine-year-old son, as you’ll probably have guessed – has a good enough ear for music that he can transpose a tune from major to minor on sight (who knew Jingle Bells could sound so funereal), but does that mean he’s ready for two hours of opera? Is he heck. Of course a fidgety temperament is also a consideration: his sister, aged 11, mostly refuses to listen to anything but Lorde, is scathing about her brother’s preference for classical music, and yet sat still, engrossed, increasingly enraptured. As the parent who adores opera, I wish Coraline had given her more to be enchanted by. It looks enticing enough: designed by Giles Cadle, the set is a folding doll’s house of sliding doors and judding angles, rooms opening from the sides like turning pages and, when Coraline steps through a half-cut door from her normal house to the other house, rotating into an eerie reflection of itself, where everything is the same only two degrees cooler (my guess, although I can’t be sure, is that lighting designer Matt Haskins does a lot with a simple shift from yellows to blues). The singing is wonderfully clear, with maybe five lines in the whole thing that my kids couldn’t catch. And there’s a lot to like in Rory Mullarkey’s libretto, especially if, like me (and friends, this is a hill I’m prepared to do serious battle on), you enjoyed the anti-capitalism 101 aspects of St George and the Dragon. In Mullarkey’s reading, the moral of Coraline isn’t just that bravery means being scared but doing it anyway: it’s that there’s a big difference between having and loving, and that life should mean more than owning things. Coraline is at that weird age – no longer quite a child, almost but not yet a teen – when toys have lost their sheen but the world outside the home is too dangerous to be explored alone. This is how she comes to leave her normal, boring house for the other house, where her other-mother promises her time, affection, but most of all stuff. You can have anything you want, she chirrups, in music full of sweetness: whether it’s sumptuous lunches or a bicycle, it can be hers. Gaiman published Coraline in 2002, not long after the marketing industry confessed to heavily investing in the pester power of “tweenies” exactly Coraline’s age; that is, just as capitalism began specifically targetting and exploiting the desires of young minds. Mullarkey’s Coraline, brilliantly, sees through such tricks: when the other-mother promises her the world, Coraline replies, “that’s what grown-ups always say”. Her put-down of quest-for-happiness culture is no less withering: “if things weren’t boring sometimes, then nothing would be fun”. But if Mullarkey transforms Coraline into a Rebecca Solnit mini-me (“it’s only moments of despair which teach us how to hope”), he also severely circumscribes the agency that Gaiman invests in his character, in a way that undermines the presentation of her courage. In the novel, she has to use all her wits to unlock the dark magic woven by the other-mother – not least, to find her real parents, locked up in a snow globe – but in the libretto, the other father tells her where her parents are before the quest has even begun. “I’m sick and tired of all these games, of all these stolen children,” he tells Coraline when asked why he’s helping her. It’s as if Mullarkey can’t bear to see a mild-mannered white guy on the side of the unredeemed baddies. Mark-Anthony Turnage’s score, meanwhile, creates its own problems. It has its exquisite moments: a deepening cadence to the other mother’s siren call, like black ink dispersing in water; the spangled charm of the two actresses next door; the jazzy squeak of the mouse orchestra in the mirror world. But for the most part it feels like a magnolia paint job: non-descript background, with none of the “sickly”, “yucky” character Turnage promised in interview. Is this really the best way to introduce kids to the absurd, excessive delights of opera? Forcing them to come to the form at its most conventional? Elsewhere in theatre, work for children is bending, shaking, breaking the form: no amount of magic tricks in Coraline can make up for its failure to do the same. Coraline is on until 7 April 2018 at the Barbican. Click here for more details.